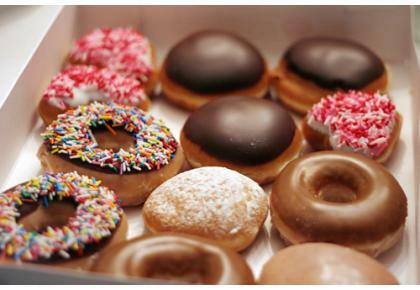 Man, do I love doughnuts! Cream, glazed, jelly, chocolate, sprinkles, I even love them little doughnut holes: if it’s a doughnut, I’m eating it. headquarters was started in my home town. I can remember riding through the city as a kid, the aroma of freshly made doughnuts floating through the air (it helped mask that heavy tobacco smell). So when I found out that Maya had never been to a Krispy Kreme, I jumped at the chance to take her. The Krispy Kreme located on Ponce (de Leon) makes their doughnuts on site and it’s really cool to see how the doughnuts go from a big batch of dough to a fully glazed treat. Opening in 1965, the Ponce de Leon location is one of Atlanta’s most historic businesses. 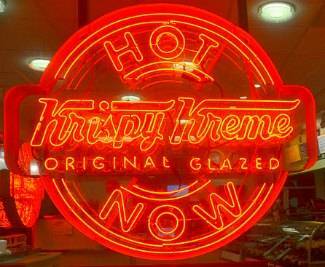 With its familiar “Hot Now” sign in the windows, customers always know where they can pick up a quick treat. Krispy Kreme also does a great job coming up with seasonal selections if you are looking to try something a little more creative than just a glazed doughnut. And I gotta get my doughnut love on now because in January, just like everyone else, I’m starting a new diet so this could be the last time I see a doughnut up close for a minute. So if anyone out there wants to meet up for a coffee and a doughnut, let me know. Times a’ ticking.